reSAWN TIMBER co. is partnering with Accoya to present a workshop on Sustainable Building with Modified Wood at Facades+. 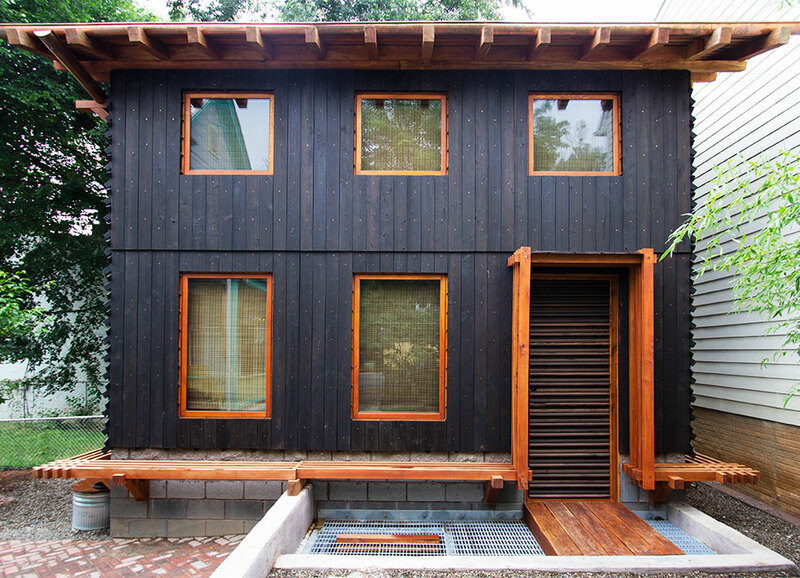 Earn 4 AIA HSW CEUs and learn about how reSAWN combines Accoya’s many benefits with our award-winning shou sugi ban charring technique. CUBISM features both charred and non-charred western red cedar in a range of colors including neutral and bold color tones. Our CHARRED designs (CHOCHOL, 4TH DIMENSION & BAUHAUS) are carefully charred, misted with water, cooled, brushed and then stained/sealed. The top coat sealer is applied prior to shipping (for exterior applications, we recommend sealing the back side as well as the face). The burning process accentuates the wood grain and joinery and creates varying colors when viewed from different angles and in different light. Our non-charred designs (SALLE 41, DIAMANT, GRIS, MARE, NO. 609, VILLA SAVOYE, PABLO, & PRINCET) are designed to highlight the graphic interest of the wood grain and joinery. All designs are standardly offered in Clear grade and can be treated to Class A Fire Rating for Interior Application. reSAWN’s WEATHERED designs highlight wood’s natural beauty and allow the material to age gracefully in place with little to no maintenance. Some of the WEATHERED designs feature our reactive finishes which seek to minimize the variation between newly installed and aged wood siding. We also offer unfinished Kebony (see MARKA and RUSS) and Accoya (see KOWHAI) which are high performing exterior woods that are meant to weather naturally to grey post-install. An approved AIA CES Provider, reSAWN TIMBER co. is excited to present its course on wood as exterior cladding for one (1) LU:HSW credit. reSAWN examines the sustainable, performance, and aesthetic benefits and innovations that have made exterior wood cladding an ideal material for architectural projects. Our carefully curated offering includes award-winning shou sugi ban charred woods, reclaimed woods, newly harvested american wood species and european oak. We provide only the highest quality materials milled to exacting standards and finished in a way that enhance the natural beauty of the wood. Our extensive offering includes wide plank flooring, FSC® Certified woods, and custom furniture with traditional joinery. We specialize in meeting the needs of architects, designers and contractors, and providing superior service and guidance in developing your specifications. Our products can assist you in achieving your project goals in aesthetic, performance and sustainability. Contact us to learn more about our FSC® products. NEWEST PROJECTS from reSAWN TIMBER co.